Eltrombopag (as olamine) 12.5mg, 25mg, 50mg, 75mg; tabs. First-line treatment of severe aplastic anemia in patients ≥2yrs, in combination with standard immunosuppressive therapy. Severe aplastic anemia in adults who have had insufficient response to immunosuppressive therapy. Not indicated for the treatment of myelodysplastic syndromes (MDS). Take on empty stomach. First-line treatment: if baseline ALT/AST levels >6×ULN, do not initiate until baseline transaminases <5×ULN. ≥12yrs: initially 150mg once daily for 6 months. Hepatic impairment or Asian ancestry: reduce initial dose by 50%. Refractory: initially 50mg once daily. Hepatic impairment or Asian ancestry: initially 25mg once daily. Titrate dose by 50mg increments every 2 weeks as needed to maintain platelet count ≥50×109/L; max 150mg daily. Monitoring, dose adjustment, and discontinuation: see full labeling. <2yrs: not established. Take on empty stomach. If baseline ALT/AST levels >6×ULN, do not initiate until baseline transaminases <5×ULN. First-line treatment (2–5yrs): initially 2.5mg/kg once daily; (6–11yrs): initially 75mg once daily. Treat for 6 months. Hepatic impairment or Asian ancestry: reduce initial dose by 50%. Monitoring, dose adjustment, and discontinuation: see full labeling. Risk for hepatic decompensation in patients with chronic hepatitis C. Risk of hepatotoxicity. Increased risk of hepatic decompensation in patients with chronic hepatitis C in combination with interferon and ribavirin; discontinue Promacta if antiviral therapy is discontinued. Increased risk of severe hepatotoxicity; monitor liver function prior to initiation, every 2 weeks during dose adjustments, and monthly after stabilized (for first-line treatment of aplastic anemia, monitor at baseline, every other day while hospitalized, and every 2 weeks during therapy; see full labeling); discontinue if ALT ≥3×ULN in those with normal liver function or ≥3× baseline (or >5×ULN, whichever is lower) in those with pre-treatment transaminase elevations and are progressive or persistent for ≥4 weeks, or if occurs with increased bilirubin, or symptoms/evidence of hepatic injury/decompensation; reinitiate therapy if benefit outweighs risk; if restarted, monitor carefully. Increased risk of death and progression of MDS to acute myeloid leukemia (AML). 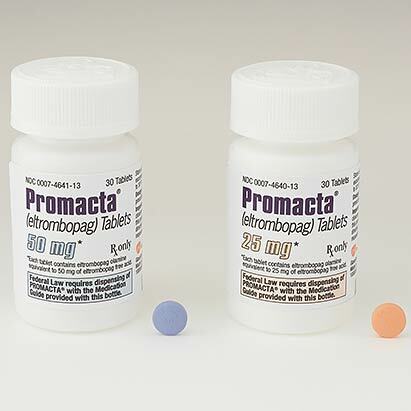 Increased risk of thromboembolism; do not use to normalize platelet counts. Do baseline eye exam; monitor for cataracts. Asian ancestry. Females of reproductive potential should use effective contraception during and for ≥7 days after stopping treatment. Pregnancy. Nursing mothers: not recommended. Potentiates substrates of OATP1B1 (eg, most statins, bosentan, ezetimibe, glyburide, olmesartan, valsartan, repaglinide, rifampin) or BCRP (eg, imatinib, irinotecan, lapatinib, methotrexate, mitoxantrone, sulfasalazine, topotecan); monitor and consider reducing their doses. Separate dosing by at least 2hrs before or 4hrs after food/drugs containing polyvalent cations (eg, Fe+2, Ca+2, Al+3, Mg+2, Se+2, Zn+2). Anemia, nausea, pyrexia, increased ALT, cough, fatigue, headache, diarrhea; hepatotoxicity, thrombotic/thromboembolic complications, cataracts. Thrombocytopenia in adult and pediatric patients ≥1year with chronic immune (idiopathic) thrombocytopenia (ITP) who have had an insufficient response to corticosteroids, immunoglobulins, or splenectomy. Should be used only in ITP patients whose degree of thrombocytopenia and clinical condition increase the risk of bleeding. Thrombocytopenia in adults with chronic hepatitis C to allow initiation and maintenance of interferon-based therapy. Should be used only in chronic hepatitis C patients whose degree of thrombocytopenia prevents starting or limiting ability to maintain interferon-based therapy. Not indicated for the treatment of myelodysplastic syndromes (MDS). Safety and efficacy not established in combination with direct-acting antiviral agents without interferon for chronic hepatitis C infection. Take on empty stomach. ITP: <1yr: not established; 1–5yrs: initially 25mg once daily; ≥6yrs: initially 50mg once daily. Hepatic impairment or Asian ancestry: initially 25mg once daily. Asian ancestry with hepatic impairment: consider initiating at 12.5mg once daily. Titrate to maintain platelet count ≥50×109/L; max 75mg once daily. Chronic hepatitis C-associated thrombocytopenia: initially 25mg once daily. Titrate dose by 25mg increments every 2 weeks as needed to achieve target platelet counts; max 100mg/day. Monitoring, dose adjustment, and discontinuation: see full labeling.